How Important is Social Media Marketing to Boost Your Online Sales? Many entrepreneurs feel that social media marketing is the “next best thing” that is conquering orthodox marketing practices. Gone are the days when businesses were only dependent upon traditional advertising methods to reach their customers. A business not having a place on social media platforms means that the business does not exist in the minds of the majority of potential online customers. Brand Recognition: Your business can gain more popularity and more loyal customers through social media only when promoted in a systematic and positive way. With the help of social media, new brands have achieved a platform where they can directly talk to their customers. According to Socialbakers, Starbucks has obtained 11,725,427 followers on Twitter, marking its position in the top 3 Twitter brands. Starbucks gained such a large social media following due to their interactive behavior with their followers and by delivering an immediate response to their feedback. The company leverages on their huge following to launch viral competitions across major cities to enhance brand recognition, as well as to generate buzz about upcoming deals and products, to great effect. Increase your webstore visitors: Every blog post, image, video or comment you share is an opportunity to get consumer’s reactions. With every comment, like or share your post receives, more people will get to see your brand in their feeds, increasing the chance of them visiting your webstore. In a study done by Search Engine Journal, it has been noticed that brands who publish native videos on Facebook reach 2.04 times more people, get 2.38 times more likes, 2.67 times more shares and 7.43 times more comments as compared to those who do not post on Facebook. The more high-quality content you post, the more inbound traffic you will generate. Moreover, with the help of targeted advertising campaigns on social media platforms (such as boosted posts on Facebook), you can set the parameters of your campaigns and target the exact audiences you desire. Improved Search Engine Rankings: An effective social media content strategy is a huge driver for earning higher spots in search engine rankings. Therefore, if your post creates a buzz on social media platforms, your company’s social media profile link will be shown in search results and can increase your search engine rankings. Dollar Shave Club, a shaving razor subscription startup (now acquired by Unilever for $1 Billion) started a campaign called #RazorBurn to educate customers about the quality of its service and to change the consumer behavior of how often individuals buy shaving razors. To launch their initial commercials, they decided to use the major social media platforms – Facebook, Twitter and Instagram – with the same hashtag #RazorBurn and drove further engagement through a series of web videos. Dollar Shave Club saw a 24% lift in social mentions after the campaign was launched and an increase in the brand’s overall followers by 6%, adding more than 320,000 followers to all of its social channels. The company also experienced a 10% increase in organic search traffic, as compared to the 3 months prior to the campaign launch. 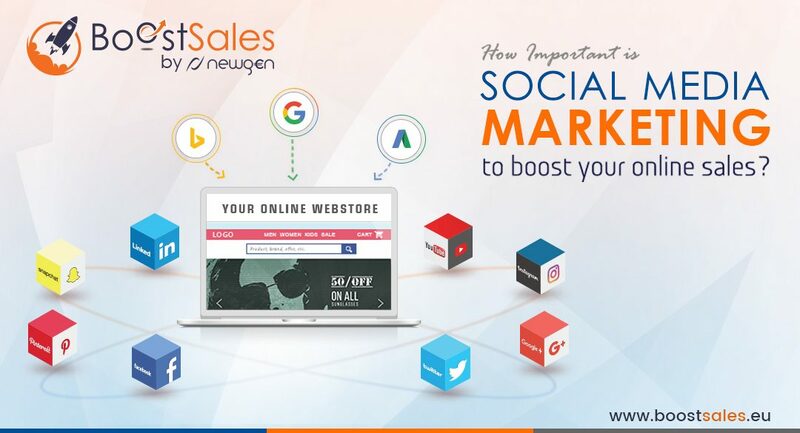 Helps in cutting marketing costs: With vast changes in the marketing landscape, social media marketing has been marked as the most effective and cost-efficient way to promote products online, which makes it a crucial channel for small businesses and start-ups to market themselves. With an increase in content marketing strategies – promoting the brand through blogs and social media posts – it has been noticed that content marketing costs 62% less as compared to traditional marketing methods. Your competition is getting social, why stay behind? You might be shocked knowing that more than 90% of brands are using two or more social media networks in their marketing strategies – you definitely wouldn’t want to fall behind. What if your competitors grab your potential customers and earn their loyalty? Being active and engaging on the top social media platforms can help you gain potential followers and make you a leading brand in the minds of customers. As you can see, the key to success for your online business is connecting with your audience, since consumers today expect more from companies. To gain popularity and better search engine rankings, it is important for you to engage with your audience using a comprehensive online marketing strategy. This will help you consistently expand the reach of your brand in addition to driving greater traffic and conversions to your E-Commerce webstore. Interested in learning about how to optimize your online business’s social media effectiveness? Get in touch with us for a consultation on your social media strategy.